The hotel is authorized to accommodate guests who present their valid personal ID, passport or any other valid proof of identity at the hotel reception. In special cases the hotel can offer an alternative accommodation as agreed, if this accommodation is not essentially different from the confirmed reservation. On the basis of a booked and confirmed accommodation the hotel is obliged to accommodate a guest by 6:00 p.m. at the latest. The room will be reserved for the guest until 6:00 p.m. unless it is determined differently in the reservation. The hotel room will be at the guest’s disposal from 2:00 p.m. on the day of arrival. If a guest will arrive late, he or she has to inform the hotel about the time of arrival at least by phone. A guest can use the hotel room during a period appointed with the hotel. On the day of departure, the guest has to vacate the hotel room and check-out by no later than 11:00 a.m., unless the period of stay was agreed differently in advance. If this time limit will not be adhered to, the hotel is entitled to charge for the following night. A guest who will check-in before 6:00 a.m. will be charged for the whole preceding night. If a guest wants to extend his or her stay, the hotel can offer a different room to the one in which the guest was originally accommodated. The guest can use the hotel room facilities and equipment, the common spaces and the hotel services. 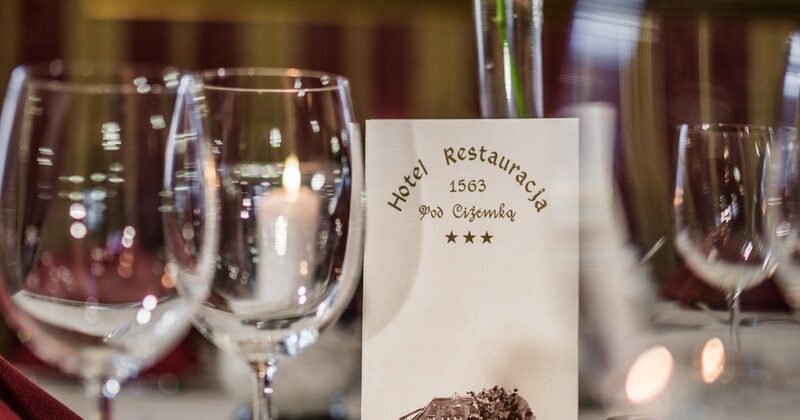 The guest is liable for damages caused to the property of the hotel according to the valid laws of the Polish law. In the hotel rooms it is forbidden to replace the furnishings or to do any other changes. In the hotel rooms smoking is prohibited by law. It is not allowed to use own electrical devices at the hotel room, with the exception of personal hygiene devices (electric shavers, massage devices, hairdryers or the like) and mobile phone and notebook chargers. The guest can receive visits in his or her room from 7:00 a.m. to 10:00 p.m. The visitors are obliged to report themselves at the hotel reception. Each time the guest leaves the room, he or she is obliged to turn off the lights, all water faucets, close the windows and leave the room key at the hotel reception. If the guest loses the key, an additional charge will be made. In the hotel room and in the other hotel spaces the guest is obliged to behave in a way not to cause fire. It is not allowed to smoke in non-smoking rooms. During a fire the guest has to inform the hotel reception immediately. From 10:00 p.m. till 7:00 a.m. the guest have to behave in a way to not disturb the night-time peace. The hotel is liable for luggage brought to the hotel by the guest and for deposited articles, if they were deposited on an appropriate place. The hotel is liable for money and valuables only if they were taken by the hotel against endorsement and stored in depository. For security reasons, it is not appropriate to leave children under 10 years of age without adult supervision in the hotel rooms or other areas of the hotel premises. The guests have to pay for the accommodation and for the additional hotel services prices according to the valid price list upon arrival. The payment for the accommodation is made by cash or by credit/debit card, if it was not agreed differently. The guest is obliged to observe the provisions of these house rules. In the event that a guest is in breach of these rules, the hotel has the right to repudiate the agreement on the provision of accommodation services before the agreed period has elapsed. Ignorance of the house rules is no excuse. Dear Guests, please review the below-mentioned rules regarding measures in case of fire hazard, fire alarm or evacuation. Unjustified use of the alarm will be fined. Please review the emergency exit instructions posted on the guest room door prompty upon your arrival and identify the nearest fire exits, the location of the evacuation staircase on respective floors, as well as hydrants, fire extinguishers and fire alarm boxes. When hearing the fire alarm or the evacuation order, leave the room immediately and make sure that its door are closed. After leaving the room, please head tothe nearest emergency door and staircase. Remain calm and leave the building. In case of a sudden smoke blocking the evacuation path and when it is not possible to hide in the hotel room or any other safe place, please follow the evacuation path in a leaning position, try to keep your head as low as possible and cover your mouths with a damp cloth. In order not to lose your orientation and sense of direction always move along the walls. While evacuating from the building do not use elevators, since in case of a fire alarm or evacuation all elevators automatically descend to the ground floor and remain there until the end of the alarm. During the evacuation, please do not return to your room to collect your personal belongings, as toxic smoke and gas can pose a serious threat to your health and life. Remain calm and follow the evacuation order and / or the instructions of the hotel staff. The fire alarm is signaled by a sound signal. The alarm is automatically sounded upon the detection of fire by the fire protection system. Immediately upon noticing fire, smoke coming out of room or smelling the odor of burning, alert the hotel office and, in necessary, all persons present on a given floor. If due to your handicap or health condition you have any doubts concerning the measures in case of a fire alarm or evacuation order, please notify the hotel office immediately. d) Until the arrival of the Fire Brigade follow orders of a person delegated by the hotel staff to manage the fire-lightning operation, and upon the arrival of the Fire Brigade follow orders of the fire-fighting commander.